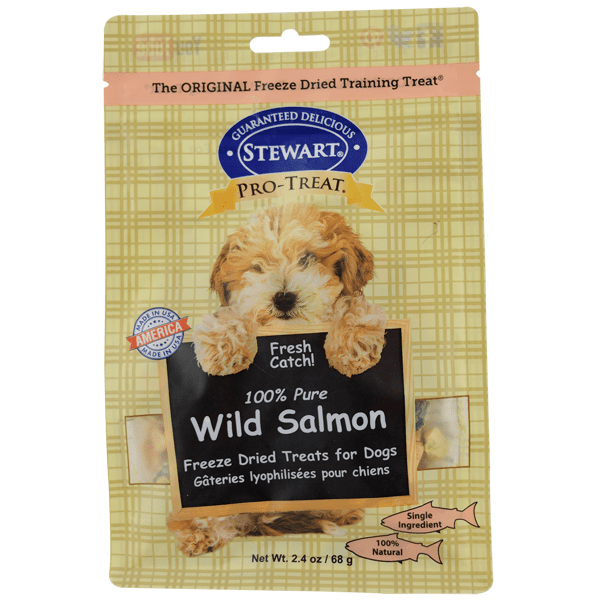 Unleash nutrition and joy with this taste of wild salmon for dogs. It’s high in lean protein and rich in Omega 3 fatty acids. Our Salmon for dog treats are considered one of the best healthy dog treats. They are an excellent source of protein, healthy fats, omega and amino acids. These nutrients help support skin, joint and brain health, as well as support your pet’s immune system. Plus, they are delicious. Pets go crazy for them! Discover a taste of the wild salmon that will drive your pup wild. Our Wild Salmon Dog Treats are the perfect way to change up your pet’s routine. 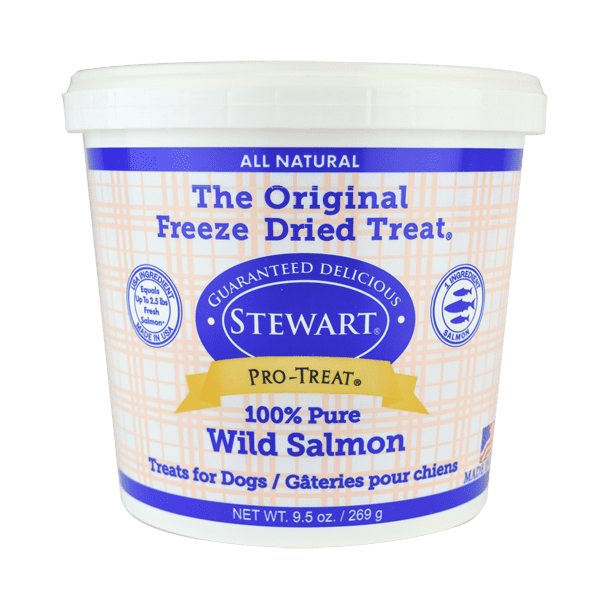 Stewart Pro-Treat Salmon for dogs with salmon skin is an all-natural dog treat made from wild Alaskan salmon. 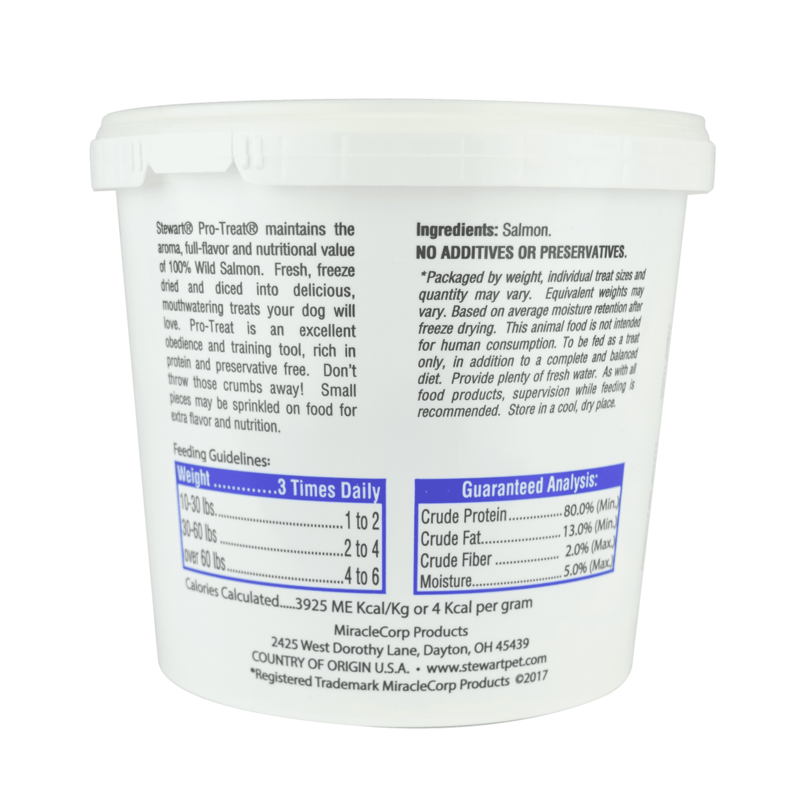 Pro-Treat salmon treats are a gluten-free, grain-free and additive-free dog treat. You can rest assured that our quality standards with USDA-certified ingredients ensure that you’re feeding safe dog treats. Our all-natural dog treats are sourced from Alaska and gently processed in small batches in the heart of the Midwest. Support skin, coat, joint and brain health plus your dog’s immune system with 100% Wild Alaskan salmon. We include salmon skin, which is rich in Omega fatty acids and Omega 3 and 6. Sourced from Alaska and made in the USA dog treats are produced in our own facilities in the heart of the Midwest. Nutrient rich fish treats for dogs include human-grade ingredients, gently processed, USDA-certified ingredients. Grain free, gluten free, soy free, with no preservatives, no artificial colors, no additives and non-GMO. Everything dogs need and nothing they don’t. Pro-treats are preferred by pros as a top dog treat for training for over 45 years. 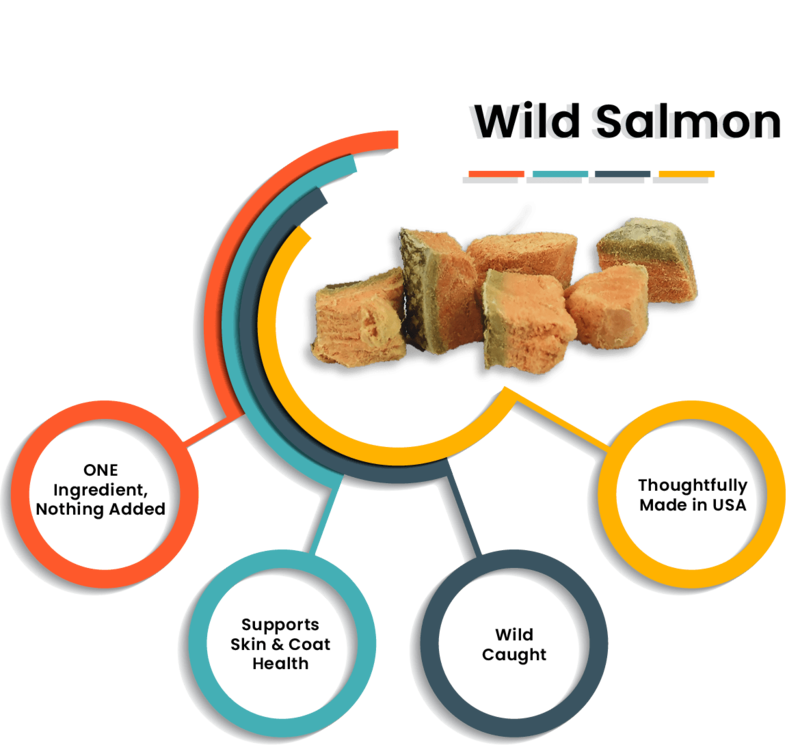 Wild Salmon dog treats are a good choice for food sensitivities, dogs with allergies or those on a limited-ingredient diet. Perfect for dogs of all sizes. Keep treats fresh longer with our sturdy re-sealable tub that’s easy to open and close. Small-batch, gently processed dog treats..
Support a healthy digestive system with no genetically modified ingredients. Naturally vitamin rich and high in protein. Good choice for energy and excitement. Tub: 2.75 oz., 9 oz.